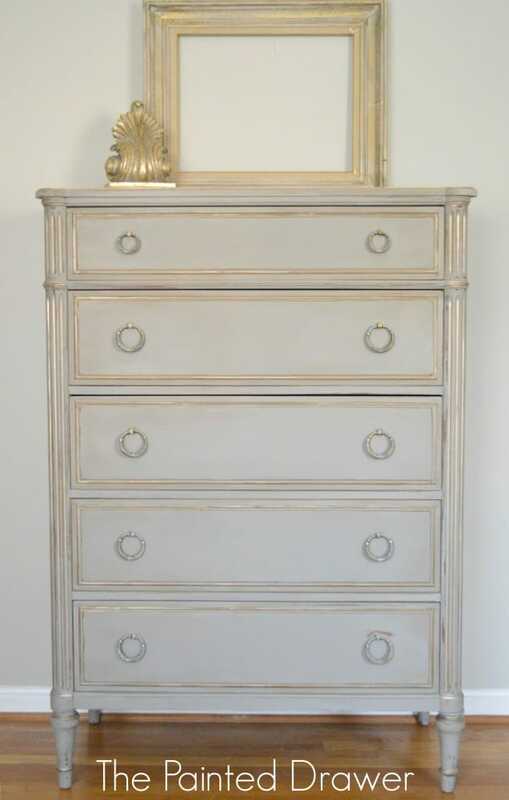 Today, I was able to finish the lovely French Linen and Gold chest of drawers! This was my favorite find that I shared on Monday. 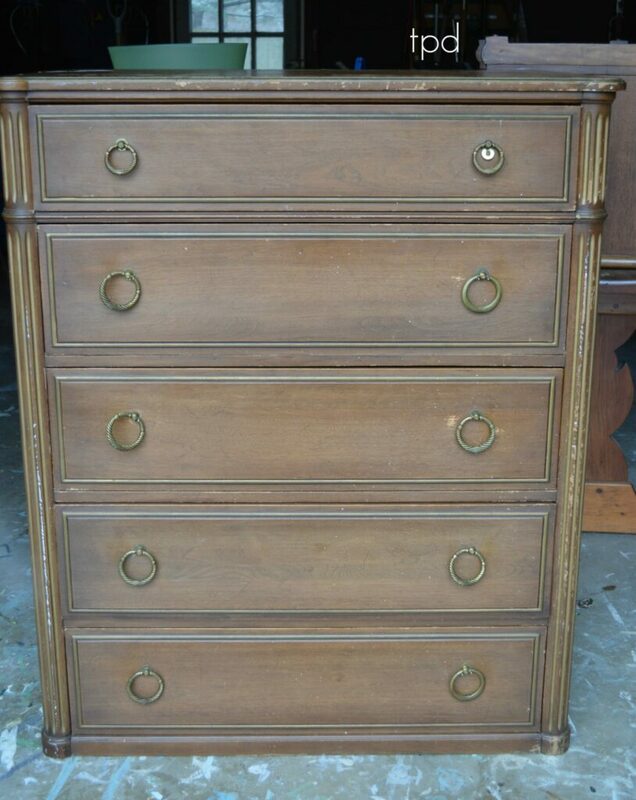 It’s a vintage Davis Cabinet Company chest of drawers that was in pretty poor shape and had temporarily lost its feet. Poor dear. 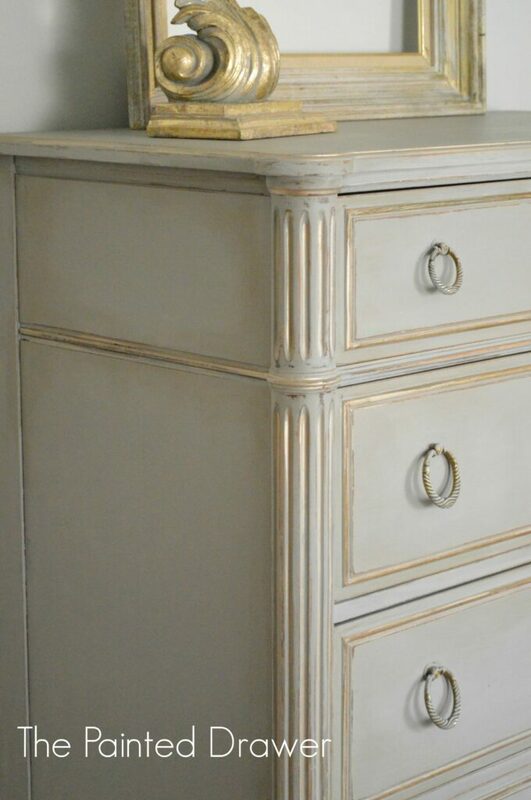 After fixing the feet and shoring up the whole piece with wood filler, glue and sandpaper, I used French Linen with gold highlights to transform this chest into a beauty. I believe it looks straight out of an old French chateau. The piece was distressed back to show off its details. 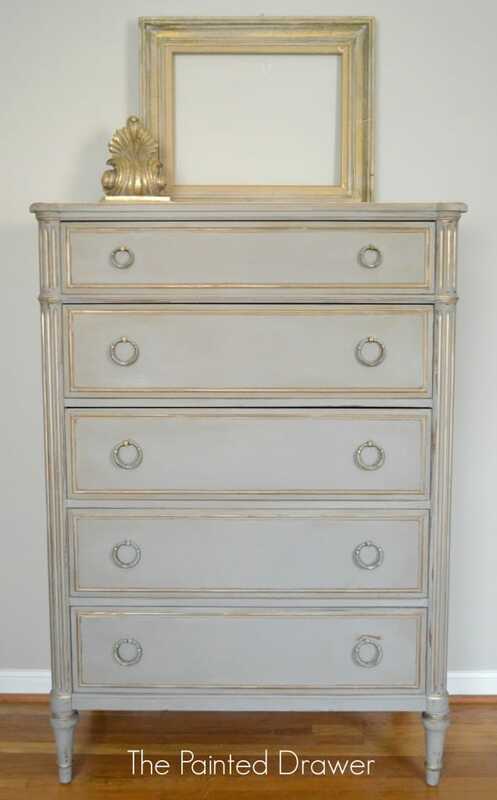 The fluting along the sides is perfect with touches of gold, as are the drawers. The original pulls tied in nicely with the look. I used both clear and dark waxes on this piece to give it depth of color and a beautiful, aged look. On Sunday, this lovely chest of drawers will be on its way to a new home. This find was truly a diamond in the rough! Oh my! Stunning!! If that piece could speak he would say thank you. I’m new. Which paint company has French Linen. And what did you use for gold accect. Hi Kylen, glad to have you follow along! The French Linen is from Annie Sloan and the gold is Martha Stewart Vintage Gold (I buy it at Home Depot). Cheers! Thank you so much, Ardith. That is so kind of you. You have a great vision and ability to make it happen. Lovely piece! French linen and gold, I thought, well, okay. Then I saw the chest. It is so beautiful. You have both a great eye and great vision. Thanks for sharing. You are welcome. This is one of my all time favorite color combos! Thx! Beautiful Suzanne, what a difference. French Linen and gold eh – I’m liking that combination! Thanks, Marie! Maybe a small piece in this combo would look good in your lovely bedroom 🙂 I just am still drooling over that window seat! Thank you so much, Diane! That is so kind of you! so fresh and beautiful. absolutely love this one. I agree, another jaw dropper! Just so, so beautiful! Suzanne, would you be kind enough to share your technique for adding the gold touches? It was just metallic paint?? Thanks Suzanne. It’s so lovely to see these old pieces so beautifully restored. Cheers, Liz (in Australia). Hi Elisabeth – sure. It is Martha Stewart Vintage Gold paint and is in a small little pot at our Home Depot. I take a small artist brush and apply. After it dries, I apply the chalk paint over it and wipe back. I do the same process again and then add more as I see fit before distressing/waxing. Thanks! Suzanne, you are awesome! Thanks for letting us know the products that you used for this gorgeous chest. I’ve been nervous about applying gold to my pieces, but it’s also because I never knew what to use and how to use it! Thanks, as this will help me down the road! So glad that I helped! Thanks! This was such a sad-looking piece until it found you! And what a blessing to have found the legs in the drawer!!! It’s a beauty now, for sure!!! Wow, this is stunning! Very nicely done dear! Thanks, Wendy and I’m so glad you are enjoying the posts! Beautiful work! You’ve created something that is fresh and yet has a wonderful vintage feel. This is gorgeous! I want it! 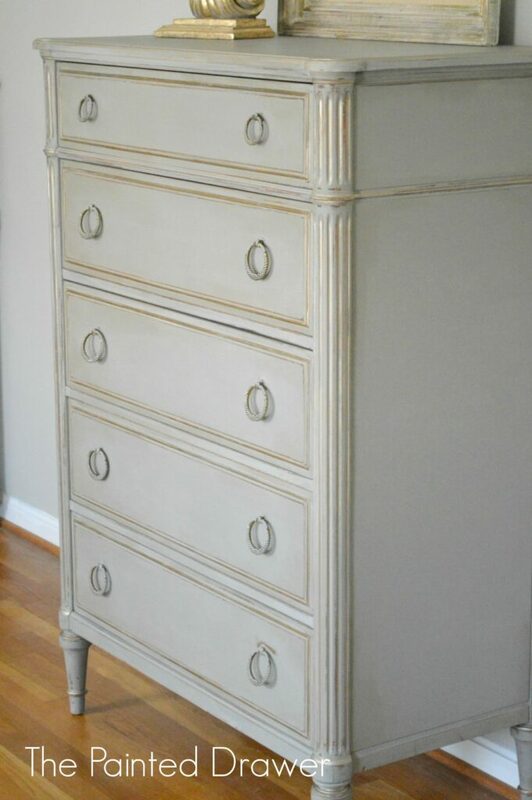 That is a beautiful piece,,do you give any advice on something I want to chalk paint but need some ideas if I send you a picture? my favorite in the history of your makeovers. 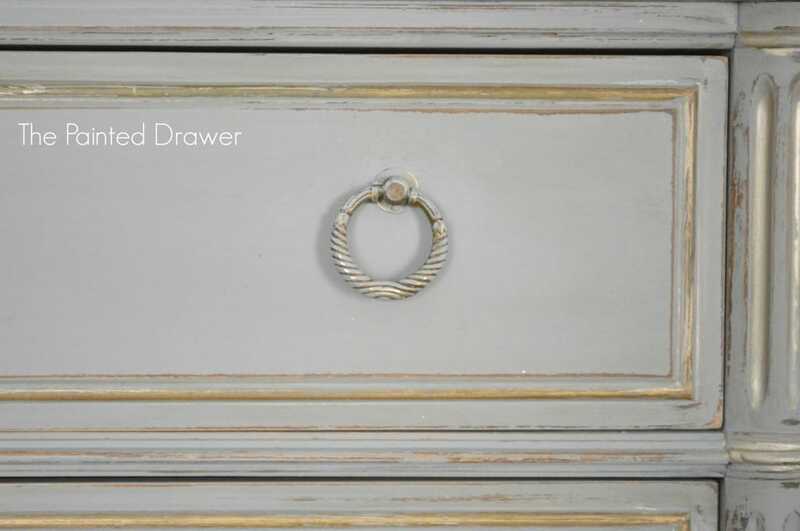 Im also painting a dresser in this ASCP French linen but im having some dificulties to get a flawless finish.the paint doesnt appear in an even way. How do you paint to get an even finish ? 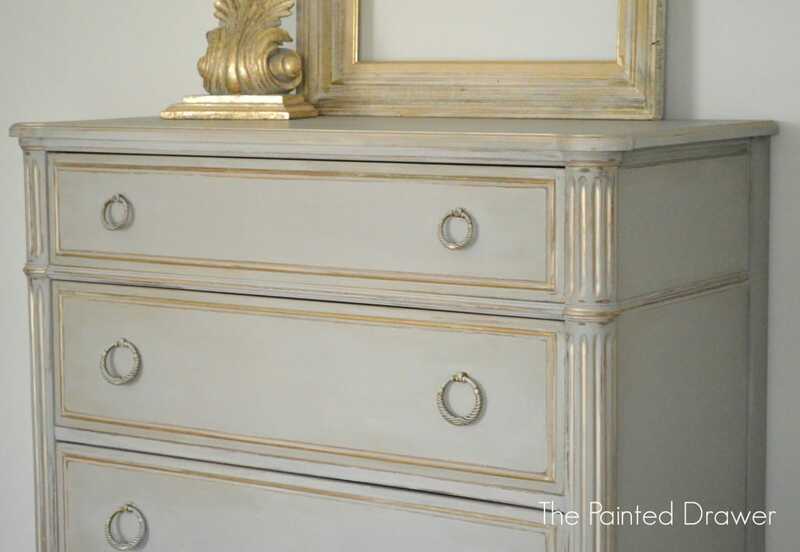 Is chalk paint good to paint with a spray gun ? Do you sand(wood still oe another fine sand paper) after waxing or betwen coats ? Thanks for all the advices you can give me. 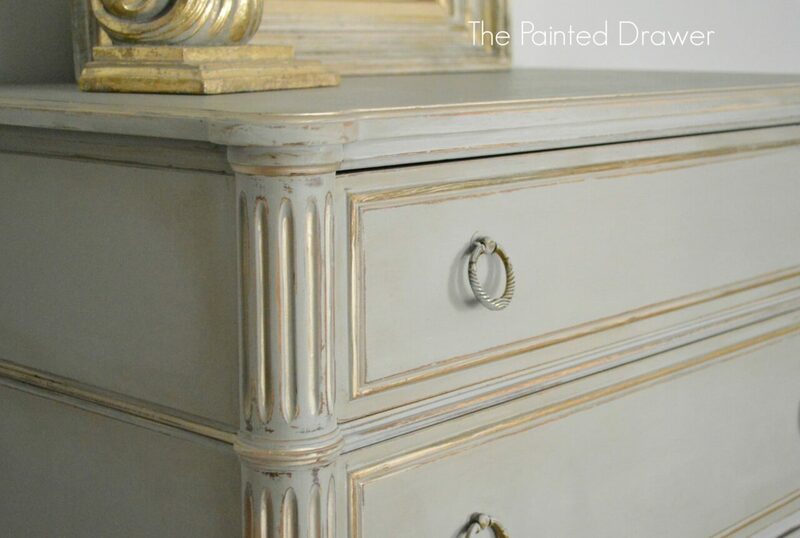 Hi Leonor, Chalk Paint doesn’t lend itself to a super flawless finish. It will dry into a very flat finish (chalk like) and even after waxing, won’t have much sheen. If you are looking for a paint that is super smooth, you should try either latex or acrylic – especially if using a sprayer. 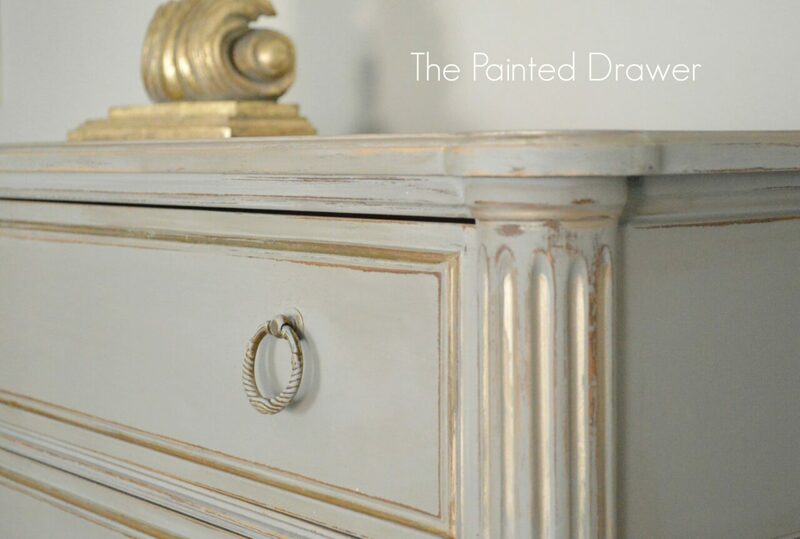 I wouldn’t use chalk paint through a sprayer as it negates the whole purpose of it. It is meant to have an old world “vibe” to it and not slick or new. A tip for a smooth finish is to paint one coat, allow to dry and sand completely with 200 grit sandpaper, then do it again until you are satisfied with the coverage. You can wax for a durable finish. I hope this helps. Cheers. This is gorgeous! There is just so much to appreciate: the lines, the grooves, the gold paint, the feet. Wonderful job. I saw your link at Elizabeth & Co. Inspired Features Link Party. This is just exquisite. I love the way the gold glimmers! This piece is gorgeous!. Did you use dark wax at all, as it looks like it has depth in the corners of the piece? Or is that just the gold? Hi Jamie, thanks so much! Yes, I used dark wax on the corners and places to give the piece depth. I just finished a sideboard in the same finish that I will be posting about tomorrow. Cheers! What did you do the gold accent with? Just beautiful!! So… Home Depot no longer sells the Martha Stewart Vintage Gold paint. Any suggestions as to where I can find it or something very similar to it??? Yes, I now use Cire-a-Dorer gold gilding wax. I have a video tutorial on it. I get mine from my Annie Sloan stockist. Thanks! Thx for your super quick response! Just picked some up and can’t wait to use it! Looks much easier to apply then paint!! !